Have you been wondering how you can record your Skype Call? All you need is to familiarize yourself with the modern Skype call recorders in the market. Vodburner for Windows is one of best Skype video recorder on PC with impressive features for quality audio and video call recordings. You can download and install this application on your device for free. After installing the Vodburner for Skype, you can commence recording your conversations immediately without much hustles. It is the right time to experience a difference when making your Skype calls. The app will ensure high-quality recordings, which you can save them for later replay. 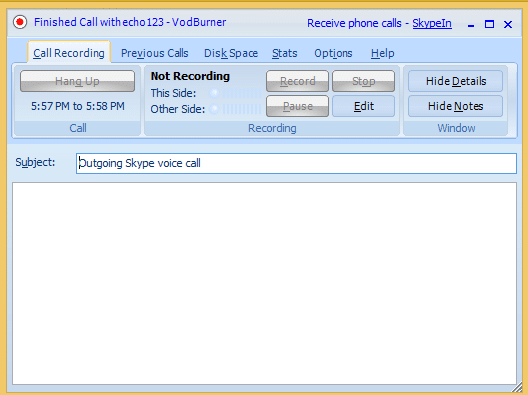 You have many reasons to use Vodburner for Windows as your default Skype application. The pleasing thing about Vodburner is the interface, which is easy and simple to use without complications. It is a small interface which does not create disruptions when chatting with your friends. On the other side, it is nice software and neatly organized giving you an easy option to locate in your favorite folder for easy access. The app favors all windows users running smoothly without errors as you may experience from other ordinary softwares. The tool works perfectly on Windows and the usability is direct to the point. The interface is self-explanatory as all buttons are labeled accordingly. Immediately you make a call on your Skype, the tool will automatically start to record. You can click “Pause” or “Stop” whenever you want to halt for whatever reason it may be. Click “Record” to continue. The screenshot above explains how you can play your previous recordings. Click “Previous Call” to access this service. Additionally, you can edit and remove any unwanted recordings sections or background parts. You can thereafter save them to your preferred location. Sometimes it’s good to add notes to your recordings. This is possible through clicking “Options-Call Recording”. You can thereafter add notes comfortably. A good working software has to be set and configured in the best way possible. To get the configure settings, click “Options” then “Configure”. This move will redirect you straight to settings. At this point you can configure Vodburner to your preferred settings. You can start with the General settings as seen from the above screenshot. Move to Recordings and do the same. 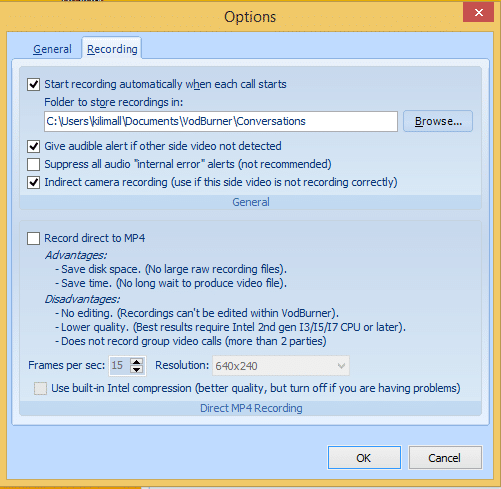 The settings are very important since they facilitate a good working tool for your Skype recording. The tool displays the mode of the audio you are recording. You can improve the quality in real-time and you can also pause your recordings or stop while still making a call. With this application, you can store your recording by saving to the PC or even you can choose to upload to YouTube it will all depend on your decision. Vodburner offers a history log containing all recorded files. This application stores all the details and has the capability to show the amount of space occupied by the recordings. Every time you make a Skype call; the application starts to record automatically for both sides of your conversation. Although it is optional, you can choose either one side or both sides of the conversation. It is annoying, Vodburner will watermark videos if you try to record the video chat and the person you are making Skype conversation does not have Vodburner installed. The full version of Vodburner is costly than all available call recorders. The most irritating thing about Vodburner for Windows is not stable and does not play well with external cameras. So when recording Skype video calls you might end up getting low-quality results. After 30 days of use, the application will be still free but the big problem is a watermark together with Vodburner will appear in your recordings. The application is limited to others users except for windows only. 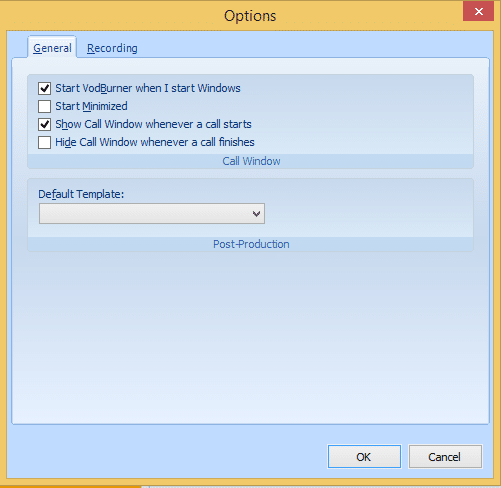 The application is good for Window users since they can view the caller side by side although the free version might have troubles without postproduction tools. When you compare this app with TalkHelper Software, the app is yet to pose a challenge to this major software in the market. However, Vodburner is an average Skype Call Software that can record high-quality Skype calls.